The free Merlin Bird ID app is now available for Android. Merlin Bird ID has also been also expanded so that it covers 400 species and contains more than 2,000 photos and 1,000 sounds. additions bring the app’s new total to 350 species. Here’s a full list of the species in the app. improvements to the ID algorithm and a fix that now allows sounds to play even when your phone’s mute switch is on. an Android version is scheduled for release in June. At that time, both versions of the app will contain 400 species. Sign up here to be notified of the Android release. Today we’re launching Merlin Bird ID, a free app to help beginners identify birds. When designing it we asked, What if an app could quickly tell you which birds are most likely based on your location, date, and a brief description? Not just which birds theoretically could occur near you, but which birds are actually reported most often by other birders. That’s what Merlin Bird ID does. 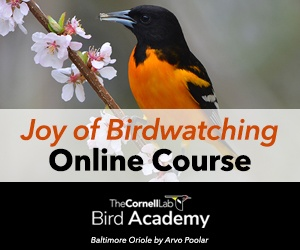 Watch the video (above) for more on how it works—and please share it via Facebook, Twitter, or email with anyone you know who’s interested in birds. Merlin Bird ID covers 285 of the most common birds of North America (with more on the way). In addition to help with ID, it contains expert tips, more than 1,400 gorgeous photos, and sounds for each species. It’s available now for iPhone and other iOS7 devices, and it’s coming in spring 2014 for Android. Most important of all, Merlin Bird ID was built with input from real bird watchers who contributed their time to data-gathering exercises hosted here at All About Birds via our Merlin Labs project. We’d like to say a heartfelt thank you to all of you who participated. Do you have questions about Merlin Bird ID? See our Merlin frequently asked questions post.